Pet industry insider and trend spotter Cynthia Waldenmaier releases her forecast on what’s hip for hounds at the Dog Park. Pet Staycations? Haberdashery Chic? There are $50,000,000,000 reasons to pay attention to her predictions: Pet Industry spending is projected to top $50 billion this year. What’s new in the Dog Park? “Frilly and Frivolous are out. Functional is in,” says industry insider and trend spotter Cynthia Waldenmaier. The Founder of the Interior Design Hound spent the past week sifting through thousands of products at the Global Pet Expo 2011 in Orlando, Florida to sniff out the Top Pet Design Trends for Hip Hounds. The reoccurring themes from pet manufacturers and designers included multi-functional, high styled products with clean lines, according to Waldenmaier. Pet Staycations: There will be no reason to take a vacation when you can create a pet resort on your own turf in the backyard. Outdoor living has reached new heights with the availability of new pet furnishings that could outshine the homeowner’s patio furniture on the deck. Performance fabrics have taken pet beds outdoors and cleaning them is a breeze. It’s the dawn of the Pet Staycation. Bamboozled: Continuing the eco-chic trend, bamboo is the new contemporary material for dog bowls, pet feeders, grooming tools and collars. Bamboo also takes a modern twist with color and scale in the form of classic trellis patterns. Following the current trend in home décor, the bamboo pattern was used on high styled bedding for pets. Candy-Coated: There is no way to candy-coat it, bright gum-drop-pops of color were everywhere from package designs to the pet products themselves. Following the color cues seen on the fashion catwalks, delicious and vibrant cherry reds and citrus hues of lemon, lime and orange will rule the animal kingdom. The color trend was seen in abundance on bowls, pet feeders, fashion bedding, collars and leads. Cool Ride: Canines will be cruisin’ in style. You’ll find an array of functional new products designed to make traveling with your pet a joy ride. From stylish seat covers to beds designed for travel, canines are in for a cool ride for Fall 2011. With a nod to the transportation trend, automobile, scooter and retro teardrop camper motifs inspired everything from collars to dog houses. Mini-seatbelt buckles embellished pet travel bags and acted as collar closures reinforcing the Cool Ride trend. Clean Sweep: Accidents happen and new products will make cleaning up after pets a breeze. Advances in technology have given the pet owner plenty of ammunition to fight in the war on pet odors, stains, shedding fur and dander. There are pet friendly solutions for cleaning & deodorizing every surface whether carpets, upholstery, wood floors, outdoor decks or cement. Royal Hounds: The British are coming! Royal Hounds abound in the form of crown motifs, regal design elements and the Union Jack. Even William and Kate’s monogram made a royal appearance on pet bedding. Haberdashery Chic: From authentic Harris Tweeds to buffalo checks, touches of menswear inspired patterns could be seen everywhere. Designers in the pet industry are barking mad for plaid designs at every price point. The plaids, checks and houndstooth patterns covered dog bowls, bedding, pet fashions and collars. Design Trend Images available on request. Cynthia Waldenmaier, a Pet Style and Design Expert, shares her insider’s view on the Pet, Home Décor, and Fashion Industries on the InteriorDesignHound.com by delivering Good Design with a Canine Twist. With over 20 years of experience in merchandising and design, Cynthia has written for Pet Product News International and Pet Style News Magazine. She will be a featured speaker at BarkWorld 2011 giving her presentation on Dog Tricks: How to Create a Pet Friendly Home. Cynthia Waldenmaier’s work has appeared in House Trends Magazine, Kitchen & Bath Business Magazine, Pet Product News International Magazine, Pet Style News Magazine, Cincinnati Magazine, Hamilton-Journal News, Cincinnati Enquirer, and the Dayton Daily News. Professional accolades include: the 40th Annual Merchandising Achievement Award from Gifts & Decorative Accessories Magazine, Retailers Award from Pet Product News International Magazine, and the American Society of Interior Designers Cornelius A. Hubbuch Design Award. A Pet Staycation is a trend forecasted by Cynthia Waldenmaier, founder of the Interior Design Hound.Forget filling the car tank up with gas! Consumers are creating pet resorts in their own backyards. It's the dawning of the Pet Staycation. 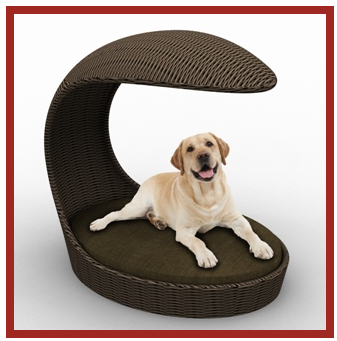 Outdoor Pet furnishings will rival the patio furniture of their owners.